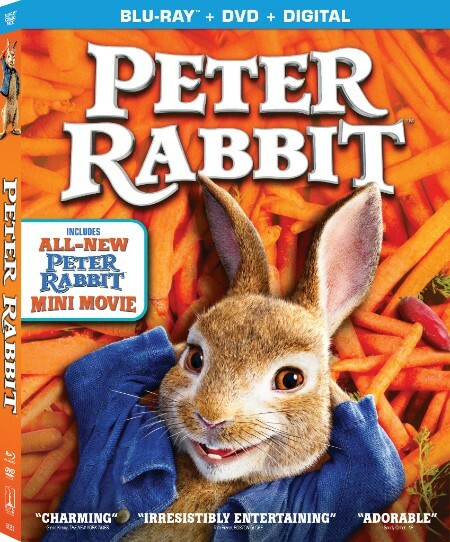 CULVER CITY, Calif. (April 2, 2018) – James Corden (Into The Woods, Trolls) stars as the beloved rebellious rabbit in the contemporary feature film adaptation PETER RABBIT ™, debuting on digital April 20 and on 4K Ultra HD™, Blu-ray and DVD May 1 from Sony Pictures Home Entertainment. In addition, the physical skus will also include digital versions of the movie, redeemable via the all-new Movies Anywhere App. Experience all the mischief in McGregor’s garden with Corden voicing Peter Rabbit, Margot Robbie (I, Tonya, Suicide Squad) as Flopsy, Elizabeth Debicki (The Great Gatsby, Guardians of the Galaxy: Vol. 2) as Mopsy, and Daisy Ridley (Star Wars: The Last Jedi) as Cotton-tail. Rose Byrne (Bridesmaids, Spy) and Domhnall Gleeson (Star Wars: The Last Jedi, Ex Machina) also star as Bea and Mr. McGregor.